A continuation to the well-received game The Red Solstice, created by the Ironward studio. Contrary to the original game though, Solstice Chronicles is a typical twin-stick shooter inspired by games such as Alienation or Helldivers. Solstice Chronicles: Missing in Action for PS4, PC and XONE is another creation of the independent Ironward studio. The team's previous game – The Red Solstice, had a fairly warm reception among the players, thus the creators decided to extend their universe with a new game. Although Solstice Chronicles continues on the storylines of the original game, it almost entirely breaks with the first installment's convention and gameplay formula, taking different audiences as its target. The game is set in a distant future, when a mysterious virus known as STROL, which turns humans into bloodthirsty mutants, dominates the Earth. A handful of lucky ones managed to escape to Mars, but plenty of threats had been waiting for them, such as sudden, unpredictable storms. As a result, working on the medicine that would stop the disease and reverse its effects became the first priority. True issues emerged, when the infected ones began to reveal their intelligence, as they are trying to execute a plan to take control over Mars. Desperate efforts put in creating the medicine fired however, thus the player's goals are to obtain it and stop the epidemic before it spreads across the entire Red Planet. The creators were inspired by such titles as Alienation or Helldivers. The game is thus a twin-stick shooter with a highlighted story, which gets extended over time with new storylines and twists. Gameplay focuses on eliminating the enemies, obtaining new weapons and developing the character one leads to battle. Tactical decisions made by the player have an enormous influence on the course of events. Through planning subsequent moves appropriately, the player can start to control the battlefield to a certain extent at one point, as well as the course of particular skirmishes. For example, when the player's goal is to get rid of the monsters in the building, they can enter through the front door, or secure the entrance and search for the place where enemies are re-spawned, in order to deprive those inside of any potential reinforcements. A large part in Solstice Chronicles: Missing in Action for PS4, PC and XONE is played by the character development system. Four classes differing in their weapons and skills were included. The player gains experience points when defeating the enemies, and once they have reached the next level, they can upgrade one of their abilities or choose a new one. The entirety of the system is represented by a skill tree reminiscent of Diablo II. Over time, the player also obtains new weapons. Apart from regular rifles available at any time, the game features the special "brutal weapons", which are described by substantially greater attack power. Use of these however, is heavily limited. The core of the experience is constituted by the story campaign. This component can be completed through playing solo, or in the co-op mode, as the creators implemented the split-screen variant. Solstice Chronicles: Missing in Action for PS4, PC and XONE utilizes the same technology that had been created for the purpose of developing the original game. However, the creators introduced a series of changes and improvements visible both in the textures' level of detail, polished particle effects, or the lighting. Thus Solstice Chronicles makes a significantly better visual impression than The Red Solstice, which came out exclusively for PCs. 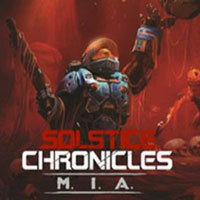 The Red Solstice creators are gathering funds for their next project: Solstice Chronicles: MIA. You can still help them out by supporting the game financially on Fig.